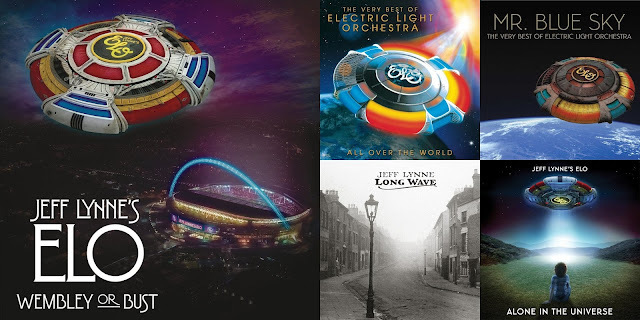 Now that the promotional campaign for "Wembley Or Bust" is ramping up to full speed, Yours Truly KJS and elobeatlesforever (elobf) thought it an apt moment to consider the potential chart impact of the new Jeff Lynne's ELO digital/2CD/3LP and film combo following its release next Friday 17th November. The pairing up of the audio and visual footage from that wonderful gig at Wembley in June is a marketing departure and really quite clever bearing in mind the amazing sales success of the 2014 Hyde Park spectacular in DVD and Blu-Ray formats. Add to that Jeff's recent UK visit, the news of a 2018 tour (and perhaps a new studio album in advance of said tour) with pre-sale ticket links for those who have pre-ordered "Wembley Or Bust" and/or the "Out Of The Blue" 2LP picture disc set (out on Friday 24th November) and there is much cause for confidence that another high chart entry is likely with ELO fans buying it in droves. 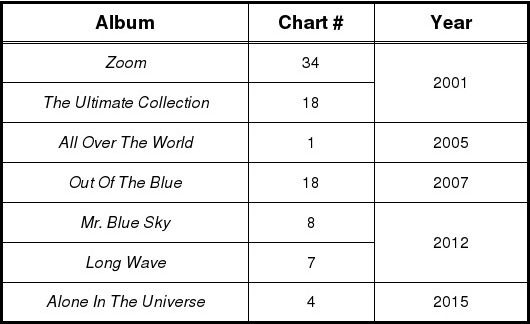 In terms of the UK chart performance of ELO/Jeff Lynne since the turn of the century, the return of Jeff to recording and performing live since 2012 has yielded three Top 10 albums and has also led to "All Over The World" hitting #1 and becoming a million seller (see above). The only potential sales hindrance to "Wembley Or Bust" will likely be its price versus that of a typical 1CD release and the fact that live albums don't always have the same appeal to the general public as do studio releases. Even so, taking everything into account, this writer is of the opinion that "Wembley Or Bust" will become the latest ELO record arrive in the UK Top 20, if not higher.